When Diane Alverio first came across the 2013 McCormick New Media Women Entrepreneur Initiative online, she and her team decided to apply on a whim. “We felt good about the product and felt that we had something new to add to the media,” said Alverio after stumbling across the grant opportunity. 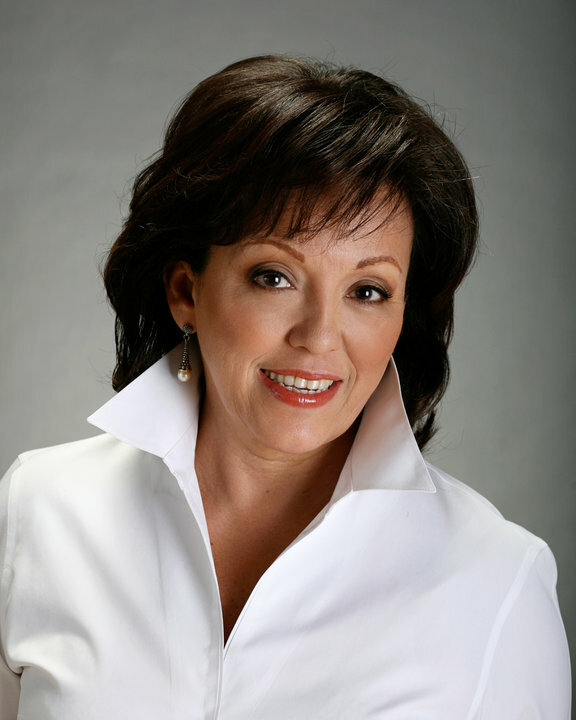 Alverio, a seasoned journalist and president of the National Association of Hispanic Journalists in the early 1990s, founded her news project, the Latino News Network. The Latino News Network is a nine-month-old English language news site based in Connecticut that focuses on Latinos and Latino issues in Southern New England. She was inspired to start this project due to the lack of well-rounded media coverage of the Latino community. “Clearly there was a need for quality coverage of Latino issues here in Connecticut as there is elsewhere,” Alverio said. The Latino News Network, which won $14,000 from McCormick’s New Media Women Entrepreneur Initiative, hopes to use the grant expand. “Hopefully in the next couple of months we will move into Massachusetts and Rhode Island,” she said. While Alverio has strong roots in journalism, building the Latino News Network was took months of planning. Above all else, Alverio notes that you need to develop a strong foundation of individuals that you are working with who are passionate about your project. “You have to have a passion for it and really believe in it, especially in the beginning because it takes a great deal of time to get it off the ground,” she said. Editor’s note: Click here to read NABJDigital profiles of past McCormick winners Retha Hill and Michelle Ferrier. NABJ-ers, are you looking to get grant money for your journalism projects? Check out Poynter’s 5 ways to get a grant that will finance your journalism careeer article. I’ve been using my iPad for more and more work-related tasks, thanks to some great apps and the device’s portability. The one negative factor is trying to type stories using the glass keyboard. I’m just no good at it. I went on eBay and bought a cheap keyboard that connected to the iPad via Bluetooth. It worked for a while, then became quite buggy and unreliable. That left me with lugging my MacBook Pro or taking my Gateway Netbook. But after attending several journalism-related events where I saw folks with cool keyboards attached to their iPads, I decided it was time to take another look at what’s out there — and spend some money. So I did what I usually do — I crowdsourced my question about what folks thought were the best iPad keyboards on the market. I considered the Logitech Ultrathin, ZAGGFolio, ClamCase Pro and the Belkin Folio. But all bets were off once I saw the Brydge, which was born from a Kickstarter campaign. As a MacBook Pro user, I love the way this keyboard simulates that experience. the clips allow you to adjust your iPad by 180 degrees. The Brydge has a built-in speaker that really enhances the sound from your iPad. It comes in Mac silver, but I bought the black polycarbonate version because I thought it looked cooler. The speakerless aluminum Brydge costs $169.99; with speakers, it’s $199.99. My black version, with speakers, is $129.99 — and worth every penny. Webbmedia Group has a great mega calendar of events that catches things not covered below. If you want to subscribe to the calendar, click here. You can also subscribe to this calendar so the information appears on your personal Google Calendar. Just go to the Webbmedia Google calendar, click the “+Google Calendar” icon at the bottom right, and then click “Yes, add this calendar” in the dialog box). The Donald W. Reynolds National Center for Business Journalism has its training calendar posted for courses through July 2013. Explore strategies and statistics to help you tell powerful stories with context, accuracy and sensitivity with the Reporting on Sexual Violenceself-directed course. Developed in partnership with the National Sexual Violence Resource Center. Journalists can learn the the essential skills that you need to tell, and sell, travel stories with NewsU’s On the Road With Serious Intent: A Journalistic Approach to Travel Writing online seminar starting on March 29 through April 26. Looking for sources and resources for covering child sexual abuse, school/youth violence, or to localize international stories? NewsU offers tips and links on these and other topics with Reporting Resources, gathered from the McCormick Foundation’s Specialized Reporting Program. The NABJ Associate Members Task Force will host a TweetChat on Jobs/Careers in Communications on April 2 at 7:00 p.m. ET. A panel of experts will share their experiences on how they got hired, how they stay employed and much more. The Donald W. Reynolds National Center for Business Journalism will award two $1,000 fellowships to attend the annual conference of the Society of American Business Editors and Writers (SABEW) in Washington April 4-6. NABJ member Christopher Nelson, NBC News Assignment Editor , was one of last year’s winners. See how Spundge can help you cover a beat, research stories, collaborate with colleagues and create content and curated streams with its Content Curation and Creation with Spundge: A Digital Tools Tutorial webinar. This webinar is part of our Digital Tools Project at 2 p.m. Eastern time, April 10. Learn how award-winning professionals work through the creative process of storytelling on a deadline in these on-demand video replays in the Video Storytelling with the Pros: Creativity on a Deadline training package. Beginning in 2013, UC Berkeley’s Graduate School of Journalism will each year offer five $10,000 postgraduate Food and Farming Journalism Fellowships. The fellowship, a project of the Knight Center in Science and Environmental Journalism, is supported by a grant from The 11th Hour Project, a program of The Schmidt Family Foundation. Online applications are due April 1. The program will announce this year’s fellows by May 1. The Society for Features Journalism is offering the 2013 Penny Bender Fuchs Diversity Fellowship for journalists of color who produce arts and features content for news organizations or those interested in pursuing careers in arts and features. SFJ is hosting this award in conjunction with its annual convention. Fellowships cover SFJ conference registration, airfare , hotel and a $300 stipend for other SFJ expenses. The application deadline is April 15. The Data Visualization Summit will be taking place on April 10-13 in San Francisco. The summit brings together leaders in Data Viz to explain and clarifiy the numerous benefits of using data visualization. If you would like to attend please contact Victoria Elton at velton@theiegroup.com. The National Conference for Media Reform is dedicated to changing the media and building a better democracy. The conference will be held in Denver on April 5-7. The National Association of Black Journalists will be hosting its 2013 NABJ Conference on Health Disparities in Washington D.C. on April 4. Topics addressed at the Media Institute will include the social determinants of health, creative community solutions to health care access and prevention, newly enacted provisions of the Affordable Care Act and HIV/AIDS in the black community. Previous conference have addressed mental health, childhood obesity, and infant mortality. The National Association of Black Journalists will be hosting the 2013 NABJ Region V Conference on April 19-20. This two-day conference will include journalism workshops featuring media professionals and educators. Workshops will be offered in the following areas: radio production and programming, print journalism, television news reporting, social media and career preparation. Get expert advice in working with writers to generate better story ideas and tell them in ways that resonate with readers at the Editors Boot Camp 2013: A Poynter Broadcast presentation. Learn more about how to join us either online or in-person for this April 22 event at 9 a.m. Eastern time. Mark your calendars for April 12-13 when NABJ-MU and the Diederich College of Communication will host the 2013 Midwest Journalism Summit. More than 75 journalism students from around the region will gather for two days of networking, hearing from seasoned journalists and participating in workshops and panels designed to build their journalism skills and savvy in whichever type of media they choose to pursue. The American Society of Journalists and Authors is hosting its annual writer’s conference on April 25-27 in New York City. The conference is geared toward freelance writers who are looking to supercharge their careers. Calling all entrepreneurs! The Ray Taliaferro NABJ Entrepreneurial Spirit Award seeks to encourage and promote journalistic entrepreneurship. The grant is awarded annually to one recipient as recognition for the introduction or significant innovation of a new or existing media enterprise. The winner will receive $5,000 and a trip to NABJ’s 2013 Convention in Orlando! The deadline is April 19. Blogalicious is planning its first-ever TECH Summit for aspiring and active startup founders, software developers and coders, bloggers with technology interests and tech thought-leaders on April 18 in Washington, D.C. The Donald W. Reynolds National Center for Business Journalism is holding a free two-part online webinar, “Getting the Goods – Interviews that Work,” on May 8-9 at noon or 4:00 p.m. EST. Pulitzer Prize winner Jacqui Banaszynski will explore the core purposes, techniques and ethics of the interview process. She will reveal different interview approaches that work best in different situations and that apply to any genre of journalism. On Day 2, she will focus on interviews that produce not just information, but true stories, rich with character, scene and detail. The collaboration between the Human Resources teams at NPR and Twitter, #NPRTwitterChat, has now been extended to a quarterly series. The one hour chat, covered in the Mashable article, ‘How to Effectively Use Twitter as a Job Search Resource‘, brings together a mix of global subject matter experts at the intersections of human resources, recruiting and social media to share insights and tips with job seekers. The next #NPRTwitterChat will be held on Thursday, May 16 from 4 to 5 p.m. EST. The Sunlight Foundation’s 5th annual TransparencyCamp on May 4th and 5th at the George Washington University’s Marvin Center, Washington, DC. For the last five years, they’ve gathered together a variety of journalists, policy creators, technologists, concerned citizens, academics, watchdogs, and others to build community, share best practices, and problem-solve challenges to work in the transparency arena. Learn how to pitch articles and reach out to major media outlets to get coverage for your book with the Self-Publishing Finishing School’s Marketing & Publicity Part 2 session at 2-3 p.m. on Wednesday, May 1. Expert John Low will show you the similarities and differences between print books and eBooks with the Self-Publishing Finishing School’s Format Your eBook for Publication session at 2-3 p.m. on Wednesday, May 8. Reporters who cover education and the difficult issues around teacher evaluation are invited to apply to attend “Grading the Teachers,” a McCormick Specialized Reporting Institute on May 8-10 in Detroit. The Donald W. Reynolds National Center for Business Journalism is holding a free two-part online webinar, “The Business of Me,” June 4-6 at noon or 4:00 p.m. In this three-day webinar with Mark Luckie of Twitter, learn how to brand and market yourself and to pitch your ideas, plus understand the basics of financial and time management. Identify five next steps to advance your career as an entrepreneur. The Knight Digital Media Center is taking applications for its two-week “Multimedia Storytelling Institute 2013,” June 10-21 at UC-Berkeley. This intensive two-week program provides seminar style and hands-on training in essential skills for digital media production. The institute is ideal for journalists, educators and communication professionals interested in a rapid-paced immersible experience in multimedia content creation through delivery. The cost is $5,400; there’s a 10% discount if you register before May 10. The Online News Association is partnering with the Global Editors Network to present several sessions at the Global News Summit 2013: Hack the Newsroom! (#GEN2013) conference on June 19-21 in Paris, France at Hotel de Ville, 5 rue de Lobau, 75004 Paris. The conference will feature industry experts giving you the tools and strategies you need to help seed, encourage and implement experimentation and start-up culture in your digital newsroom. Registration is open to all ONA members and you can save 30 percent on registration if you purchase your tickets by Feb. 18. Early bird tickets are € 839 ($1,119.95) for GEN and ONA members and € 1,199 ($1,600.31). The National Association of Black Journalists welcomes you to join us from July 31-August 4, 2013 as we gather in Orlando for the 38th Annual Convention and Career Fair! Thousands of journalists, media executives, public relations professionals, and students are expected to attend to network, participate in professional development sessions and celebrate excellence in journalism. The Pew Research Center’s Project for Excellence in Journalism recently shared its State of the New Media 2013: An Annual Report on American Journalism. In the report, Pew noted several digital developments and trends as they relate to news, especially within the digital media landscape from 2012. Here are some of the data. 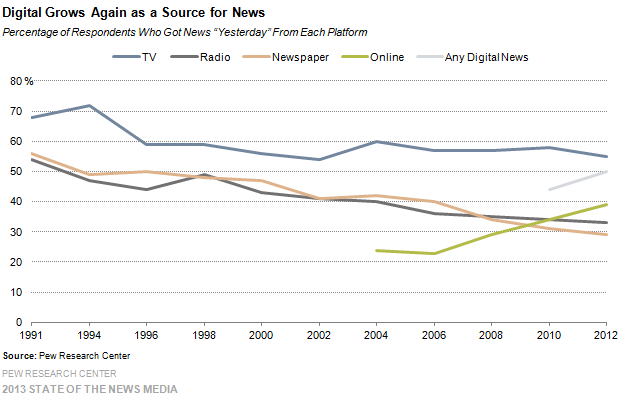 Compared to other media platforms like magazines, newspapers and television, online news was the only media platform to show growth in the survey. Most mobile news users are not replacing one platform with another; they are consuming more news than they had in the past. More than half of tablet news users, 54%, say they also get news on a smartphone; 77% also get news on a desktop or laptop computer; 50% get news in print and a quarter get news on all four, according to a 2012 study by Pew Research Center and the Economist Group. In addition, 31 percent of tablet users note that they are consuming more news via their mobile devices. Furthermore, 43 percent said their tablet devices are helping to increase the percentage of news that they consume. Almost three quarters, 64 percent, of smartphone users get their news on laptops or desktops and a little over a quarter, 37 percent, of those users get their news from a tablet. Social media, which is believed to be fueled by the increase in mobile devices, has also lead U.S. adults to a deeper consumption of news. Pew studies show that around 47 percent of smartphone users get their news through a social network, and 39 percent of tablet users did as well. 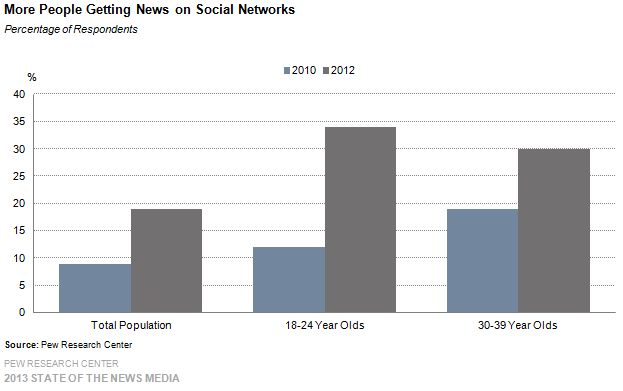 There was also growth in the number of newspapers migrating to paid digital content, according to Pew. In the last year, 450 of the 1,380 of the newspaper dailies have started or shared plans for a paid content subscription or pay wall plan, which usually gives readers a certain number of free articles before forcing users to pay. You can read more about the digital developments in American journalism here and visit www.stateofthemedia.org for more information on other media platforms. And please take our poll, below. Webbmedia Group has a great mega calendar of events that catches things not covered below. If you want to subscribe to the calendar, click here. You can also subscribe to this calendar so the information appears on your personal Google Calendar. Just go to the Webbmedia Google calendar, click the “+Google Calendar” icon at the bottom right, and then click “Yes, add this calendar” in the dialog box). The Donald W. Reynolds National Center for Business Journalism has its training calendar posted for courses through June 2013. Enroll in the Audience Growth and Digital Content Strategies: API Training online course for your guide to key strategies for your digital content that can help your organization improve its digital presence and grow audience. Developed in partnership with the American Press Institute. Explore strategies and statistics to help you tell powerful stories with context, accuracy and sensitivity with the Reporting on Sexual Violence self-directed course. Developed in partnership with the National Sexual Violence Resource Center. The American Society of Journalists and Authors is hosting its annual writer’s conference on April 25-27 in New York City. The conference is geared toward freelance writers who are looking to supercharge their careers. The early bird registration discount ends March 22.